Santosha sits right on Long Bay Beach and is perfect for beach weddings, anniversaries, and any special event. You can’t help but feel like you’re at a resort here, since the villa has private tennis courts, basketball courts, a pool, gym, and a media room. Santosha Villa Esate is a beachfront villa with luxurious amenities like convenience to CuisinArt Golf Resort, daily housekeeping, and 8-hour butler service. Thanks to its location, the villa enjoys sunrise and sunset views over the sea. 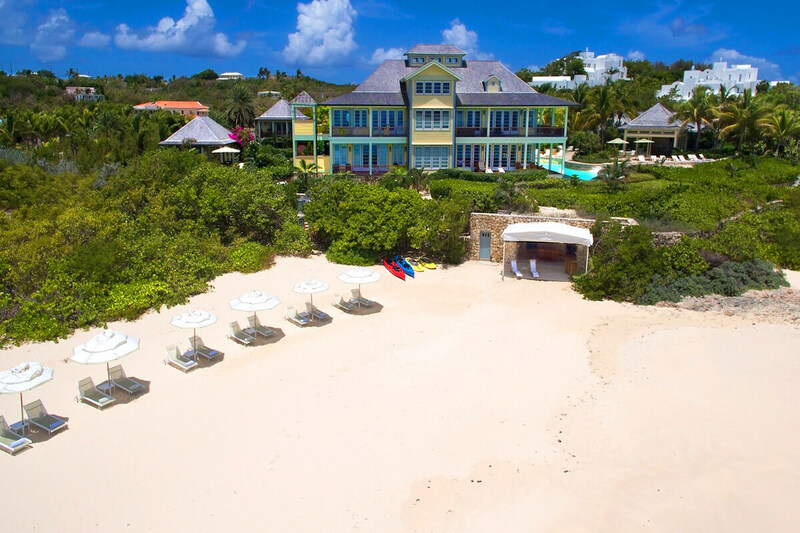 Santosha sits on the coast of Long Bay and is a short swim from Meads Bay, so guests can easily explore Anguilla’s northwestern shore. Santosha’s stretch of the beach has loungers with umbrellas, kayaks, and standup paddle boards. Off to the side, there’s a stone grotto that opens to the beach and holds romantic dining with service for 8. The beach’s privacy is perfect for destination weddings. Up at the villa, a freeform pool winds along the wraparound porch. Loungers line the pool and a hot tub sits a few feet away. The terrace extends into the gardens and holds dining, seating, and walking paths. Guests can also enjoy private access to the villa’s lighted tennis courts, basketball court, and indoor gym. The Main House and all three Guest Cottages have their own terraces and balconies with dining and lounging as well, so guests can spread out as they breathe in the salty air. Santosha is fully air-conditioned and comes equipped with an alarm system, WiFi, and screened windows. The Main House’s living room is lined with French doors that bring in the ocean views and provide easy access to the wraparound porch. The dining room has a similar design and seats eight guests around a circular table. The gourmet kitchen has commercial appliances and tons of space to prepare any meal. All four bedrooms overlook the water and have an ensuite bathroom. Two bedrooms on the first floor have king beds, private terraces, ocean views, and outdoor showers. The third bedroom has a king bed and outdoor shower as well, but can only be accessed from the Main House. Upstairs, there’s a twin suite with two beds, a pool view, and an outdoor shower. Each of the three guest cottages has a private veranda, WiFi, air-conditioning, window screens, and flatscreen TVs. Guest House A has two king suites that each have exterior access, TVs, and ensuite bathrooms with outdoor showers. Guest House B has a king suite with exterior access, a TV, and an ensuite bathroom. Guest House C also has a king suite with exterior access, a TV, and an ensuite bathroom. Finally, there’s an air-conditioned Nanny Apartment that has a king bed, a lounge, a kitchenette, and an ensuite bathroom. Santosha is central to town, West End restaurants, and beaches. This resort-level beauty can be combined with its sister villas, Sea, Sand, and Sky, to sleep 50 people. Transfers not included, but an be arranged for an additional fee.